With all of the crazy up and down fiasco that has been happening with the temperatures outside this odd winter season, we've both been looking for dinners that fit into the comfort food (at least to us) category. We've done several hearty pasta recipes and repeat casseroles, but one area we've been neglecting is soup! 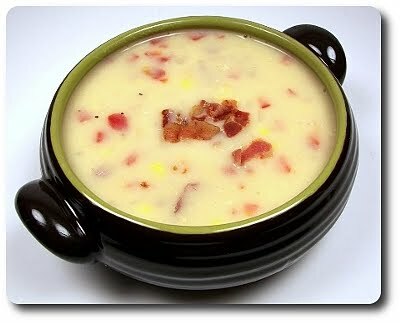 To rectify that, we decided tonight's dinner would be this Cheddar Chicken Chowder. I do have to say starting off, it's hard to go wrong when the directions begin by crisping up three slices of bacon! 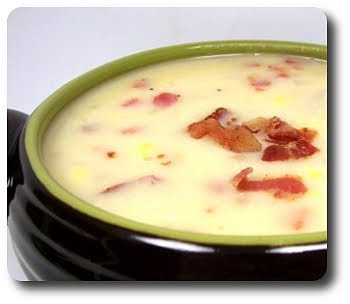 And you won't waste all the zesty drippings from the bacon either, most of the fat left behind is used to start cooking the pound of chopped (keep it bite-sized) chicken, onions, red bell pepper and a few cloves of minced garlic. As soon as the vegetables begin to soften, diced potatoes and several cups of broth hop into the mix to simmer. When the potatoes had become tender in the bubbling base, corn kernels (we used frozen that we had in the freezer from last year's fresh haul) were stirred in, along with a couple cups of milk, which was first combined with flour to tighten up the liquids. Brought back up to a simmer and allowed to thicken, to give this chowder its cheesy edge, a full cup of shredded cheddar (the sharper, the better - at least for us!) was sprinkled over the pot and stirred in, off heat, to blend in. As always, be sure to taste this before dishing it out - a re-seasoning with salt and an ample dose of fresh ground black pepper was definitely in order here. This was pure comfort in a hand held bowl - the chowder was creamy and satisfying, yet still quite light as there was a larger ratio of broth to milk. All the added bits gave the soup a lovely contrast in textures - the tender chicken, chunky bits of soft potatoes (and by using a waxy potato, it won't dissolve in the soup - the cubes held their shape well!) and especially the sweet nibbly bits of corn. 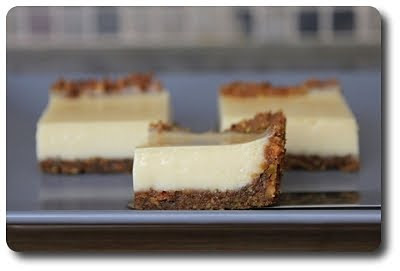 This is one top-notch recipe that will surely be making the rounds here often! 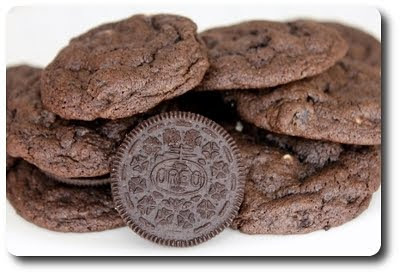 Jeff requested cookies for this week's Wednesday Treat Day, but he couldn't nail down just which kind he wanted. While some variety of chocolate chip, sugar or oatmeal cookies all sounded good, none of them really grabbed our attention. 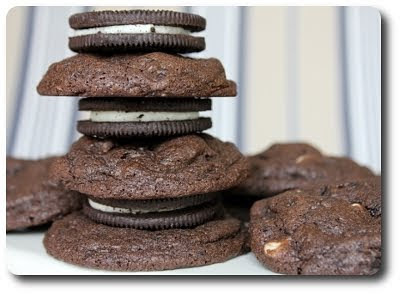 That is, until the clouds parted and Nicole from Baking Bites came through with yet another winning recipe from the substantial list on her site - these Chocolate Cookies n’ Cream Cookies. The dough for these cookies is rich with cocoa powder, butter, two types of sugar (brown and granulated) and plenty of mix-ins. You can use either natural cocoa powder or Dutch - I decided to go with a combination of both just for added interest, but pick one or the other if you like. Those mix-ins I mentioned? 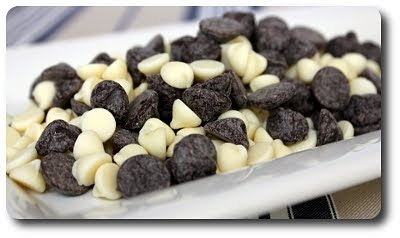 Bittersweet chocolate chips, white chocolate chips and an ample amount of those ever-loved, hard-to-resist, cream-stuffed chocolate cookies. 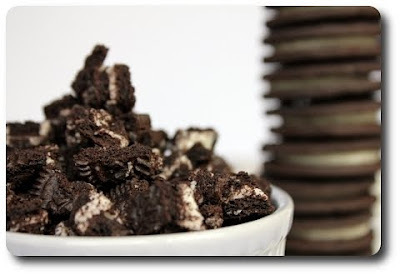 Yes, plenty of chopped Oreo cookies are stirred right into the cookie dough! Resist the temptation to dump all these ingredients in and use your mixer to blend them in - use a sturdy wooden spoon as the mixer may break up the cookies a bit too much and you'd miss out on those crunchy Oreo nuggets. 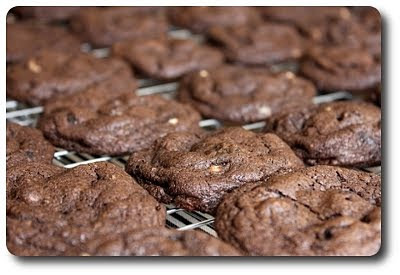 We mixed, scooped and baked the dough in succession, making for mounds of cookies in short order. I'm sure you could prepare the dough ahead of time and chill it if you'd like, but we didn't find it necessary. The cookies seemed to spread enough, yet not so much that you end up with thin, flat rounds. With crisp edges around the outer ring, the closer you get to the chunky center, the more soft and chewy the cookies become - one of my favorite mix of textures for a cookie! The combination of the bolder bittersweet pieces, the more sweet, creamy white chocolate and Oreo pieces definitely knocked these jam-packed cookies out of the park - now we just need to get them into the office before Jeff changes his mind and keeps them all! 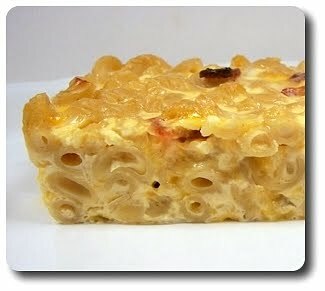 Not too long after Jeff's surgery, he equated macaroni and cheese to pizza - at first, I said "What in the world are you talking about? ", but then he went on a lengthy explanation and it started to make sense (I'm going to blame it on his pain pills for this to be on his mind!). He went on about how there seems to be endless variations of the mac and everyone has their own spin on it. I guess you could say that about a lot of dishes, but in this context, he had a good point. With all this talk, of course he had me wanting to work a new variation of it into dinner soon (probably his intention from the beginning!) 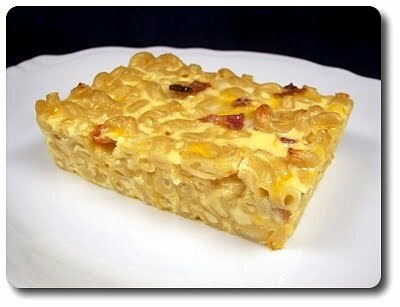 With an opened package of bacon in the refrigerator, which is nothing unusual around here, this Three-Cheese Baked Macaroni looked fun to try. While waiting on the well-salted water to come up to a rapid bubble, chopped bacon went into a small (cast-iron for us!) skillet to crisp and render out is most of its usable fat. Just before you would pull it from the heat, a few cloves of minced garlic hit the pan until its pungent aroma strikes your nose with a gentle slap. With the bits scooped out to drain on a paper towel-lined plate, this is where this dish gets interesting. Instead of a classic cheese sauce, this recipe calls for a rich combination of evaporated milk, three eggs and a mess of cheeses - sharp cheddar, smooth Monterey Jack and salty Parmesan. 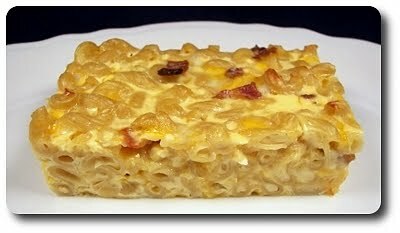 You may have used eggs in macaroni and cheese, but as far as I can recall, they have never worked their way into any recipes we've tried over the years. A hint of cayenne and fresh grated nutmeg join in for added interest and a mild bite. My eyes couldn't help but dart back to that lonely slick of bacon drippings left behind in the skillet, so forgive me as I had to whisk a spoonful or two into the egg-y base. With that done, the cooked macaroni and bacon hop into the mix and the whole shebang is poured into one of our square pans to bake through. 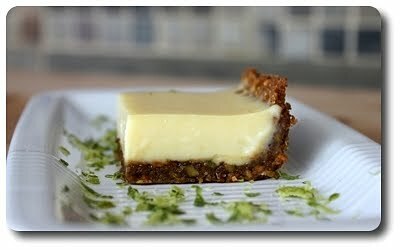 There is definitely a different texture than what we're used to - quite dense, custard-y and not nearly as "gooey". This does make pulling out clean squares easy enough though (especially with a short rest)! While the top does get a bit of a crust as it bakes, I did find myself thinking a crunchy breadcrumb topping would have been a good addition to throw on too. While I don't think this will become one of our go-to recipes when we have a cheesy pasta craving, we did find it a suitable comforting dish that we'd make again. Friday afternoon, I asked Jeff what he'd like to do for this week's Wednesday Treat Day. His response was "Oops, I think I forgot to tell you I took Wednesday off... can we move it to Monday?". Um, sure... I said "But you realize that's Valentine's Day" . He then said "Oh yeah! 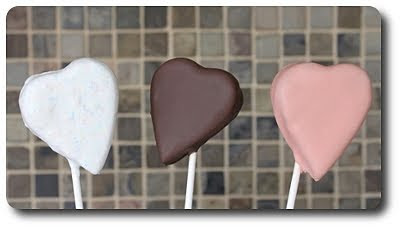 Ok, so let's do a heart themed treat!" Fine, I thought - I should be able to manage that. But, then what the heck are we going to do in a heart shape? Especially on a short deadline! 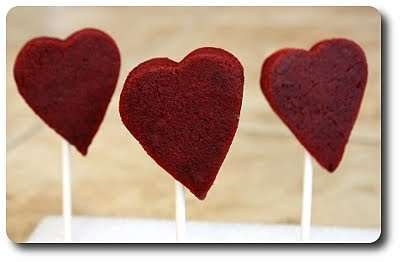 I looked around the web, gathered a few ideas and with inspiration from the Cake Ball Queen herself, Bakerella, we ended up making these - Red Velvet Heart-Shaped Cake Ball Pops! What we did was bake a basic, from-scratch red velvet cake recipe in a 9" x 13" pan. While the cake was off cooling, we then made a mess of homemade cream cheese frosting. With the cooled cake crumbled into pieces, the tender bits are mashed together with a hearty scoop or two of the frosting. It sounds crazy if you've never heard of the process before, but it works like a charm! Here's where we differ from all the other versions we've seen. Instead of rolling them into balls (which we ended up doing with some - more on that later), we took the moist, yet not sticky, mass of cake and frosting and pressed it into a plastic wrap-lined short sided 9" x 13" x 1" baking pan. After giving the slab a short chill in the freezer, we stamped out the heart shapes and gently meandered a lollipop stick in. With one round of cutting hearts out of the cake and frosting mixture, we ended up with 22 - I asked Jeff if he wanted more to bring in, but he said that was enough. 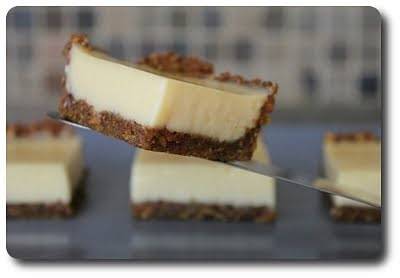 With the remaining scraps, we rolled them together into one large ball and used a tablespoon cookie scoop to portion out smaller portions... as if we were going to waste any crumb! Well, to be honest, we did roll most of the scraps into balls - we couldn't resist eating a few chunks along the way. We did dip the tip of each stick in a bit of melted candy coating beforehand, giving the pops an extra anchor during the dipping process. 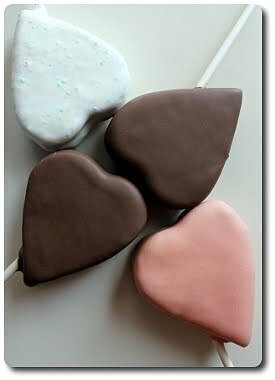 Jeff wanted the cake hearts coated in color if possible, so we went the route of using candy melts (also called confectionery coating). I couldn't resist, however, dipping several in chocolate, just because. 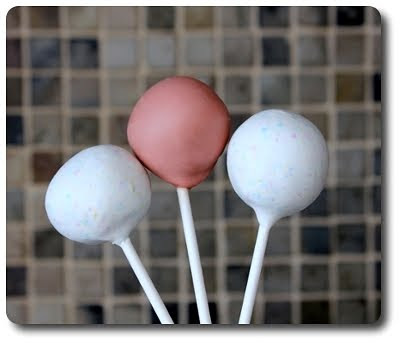 Besides the darker chocolate, the other two colors were pink and white, but the white was a bit more special - it was a new pastel coating just-on-the-market that had speckles of blue, pink, yellow and red running through it. Fun! Between the cake, frosting and coating, I thought these might be sugar-y bombs of death. It could be that I just have an insatiable sweet tooth, but neither of us find them so sickeningly sweet that we had to run and brush our teeth. 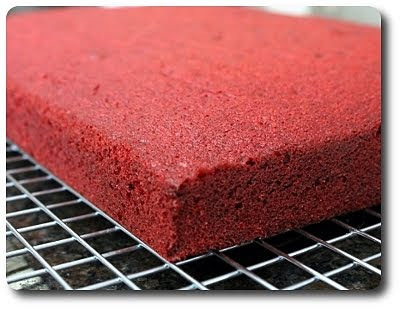 While the coating outside was firm, the cake inside was so soft, smooth and luscious (if left at room temperature), with a show stopper bright red color. 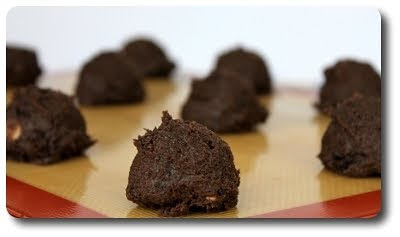 From start to finish, these did take quite a long time to finish from baking the cake, making the frosting and creating the cake ball mixture, along with various resting times in the refrigerator or freezer during the whole process. 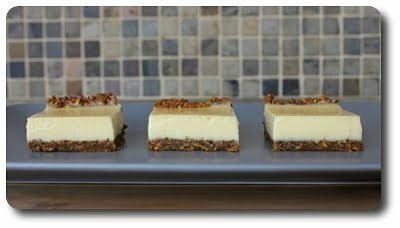 With all the work, I would absolutely do another version of these again - you could easily adapt the process to your needs and run with the same idea, even using other flavors of cake. Birthdays, baby showers, holidays or for no other reason that you desperately need a fantastic treat to share - my mind is spinning with ideas! One note about the frosting - I didn't know how much we were going to need, so I made a full batch. We actually ended up only using about half of it, but I'm not going to complain about leftover frosting. Before Jeff had his surgery a few weeks ago, I tried to plan ahead and get some meals into the freezer. I figured I may not have the time, or energy, to get a decent dinner on the table after all was said and done. 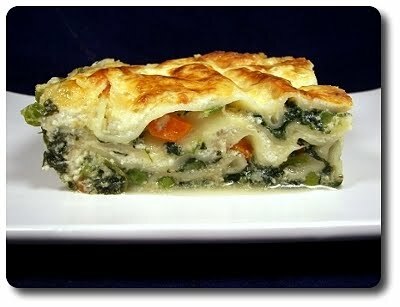 One of those happened to be this Freeze-Ahead Lasagna Primavera, which I was quite thankful for when we finally were ready to use it! You'll need to make a white sauce for this lasagna, which begins with a base of heated olive oil, into which flour and garlic are whisked in. 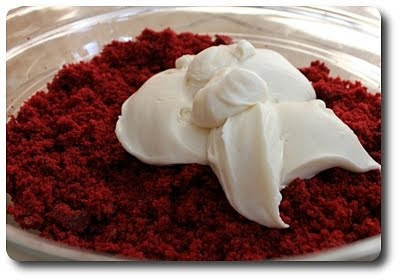 You don't need this mixture to attain any color, but you do want to give the flour enough time to cook out and remove any raw pastiness - two or three minutes, constantly whisking it around, would be sufficient. When you add the milk to create the sauce, try not to dump it in all at once - gradually pouring it in, while whisking, I find helps the flour and milk mixture mingle and marry a bit better. 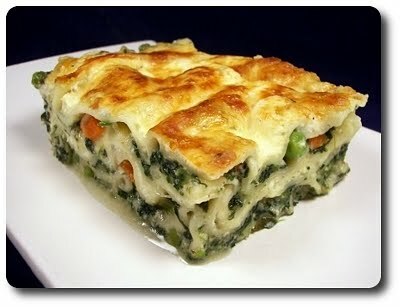 If you'd like to make this a bit lighter - try swapping out a couple cups of the milk with chicken or vegetable broth. After the milk had time to thicken, the vegetable part that is added next in this dish makes life easy, using frozen spinach and peas, while still adding a lively freshness by calling for thinly sliced raw carrots. As that heats through, the cheese layer comes together by seasoning a scant two cups of ricotta with an egg, salt, fresh ground black pepper and just a pinch of fresh grated nutmeg. 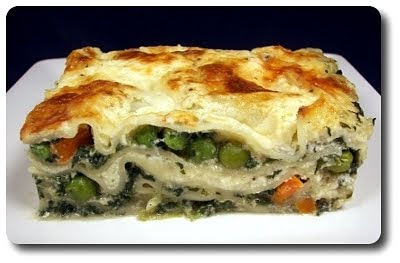 Keeping with the not-too-fussy theme, we followed along with the recipe using no-boil lasagna noodles. I don't mind these at all and find them pretty convenient - I know some people don't like the end texture though. I'm sure you could use regular noodles in this to keep a more sturdy bite to the pasta, but you may need to either boil them first or soak them in hot water - I don't think this may be saucy enough to add them raw like the no-boil noodles. Layered like any other lasagna with all the sauce, noodles and ricotta, you'll also be slipping shredded mozzarella and grated Parmesan into some of them, along with a smattering on top. After being assembled, all you do to this is cover the top well (plastic wrap, then foil - no spills!) and set the pan in the freezer to chill out. We baked this from frozen and it took just over an hour and a half, covered, plus another 30 minutes or so, uncovered to add some color on top and finishing heating through. What did we think? We were quite surprised with just how well it held up after being frozen and baked! The vegetables were not over done or mushy, and in fact, the carrots still had a welcomed firmness (without being crunchy). Giving it a solid fifteen minute rest after pulling it from the oven, the lasagna was still plenty warm, yet we were able to pull out clean, well-preserved slices that didn't collapse as each rectangle hit the plate - score! The trio of cheeses also fit in well, lending enough of a wallop without casting a shadow over the sweet peas, carrots and spinach. If you have any fear of baking from frozen (like your favorite dish cracking or shattering), use a metal or one-time use foil baking pan. You could also line your baking dish completely with foil, assemble and freeze, then lift out the frozen solid lasagna, wrap the icy block well. 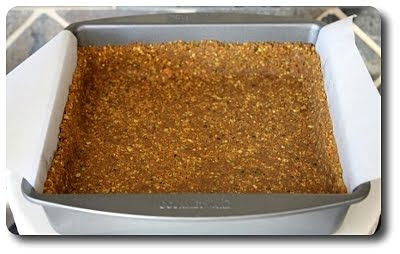 When you are ready, peel off the foil, drop it back into the same pan and bake from there. Oh, and if you are wondering, do you have to freeze this first? Absolutely not - if you 'd like to make it right after assembly, toss the dish in the oven for 45 minutes, covered, then uncover and bake until the sauce begins to bubble around the edges and the top has browned - about 20 extra minutes. Jeff's recovery from his surgery several weeks ago is almost complete and he was given clearance to go back to work! He has done very well and the pain and numbness in his arms and fingers have almost completely cleared up - the doctor said to expect the remaining issues to clear up within 6 months. With his first day back yesterday, we figured we might as well rev up the weekly Wednesday Treat Day tradition again! I thought a treat that was squishy (hint!) and whimsical would be a good choice - I said that analogy to Jeff and he kind of crossed his eyes like "wha...?". 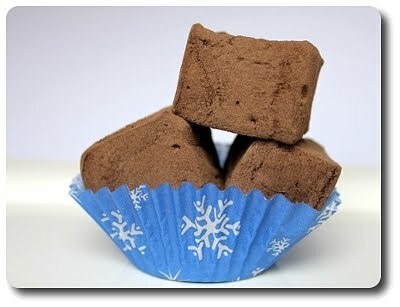 Ok, maybe that wasn't the best way to say it, but what I decided to make were these Chocolate-Honey Marshmallows! These egg-less (thought not veggie-friendly, sorry! They do contain gelatin.) 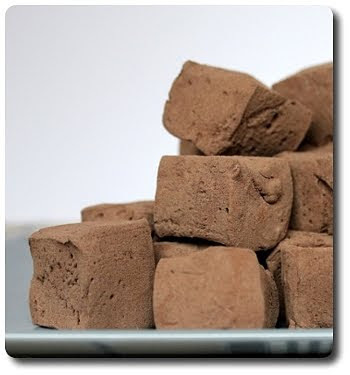 cocoa-dusted squares are not nearly as tough as you might think they are to make at home. 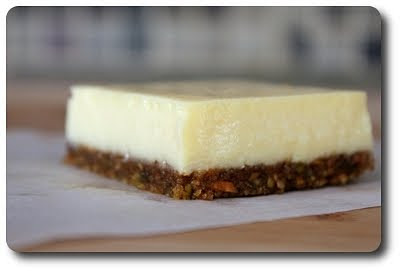 I do highly suggest you only try this if you will be using a stand mixer though! Sugar, corn syrup, honey and a bit of salt dissolve in just a half cup of water to start the syrup used to create the marshmallows. The recipe called for heating this mixture in a small 2-quart saucepan, but I went with one a bit large and was thankful I did. Just as the hot sugar came to a boil, it started to bubble up the sides of the pan and went almost to the top - if I used the smaller pan and not caught it in time, there would have been a disaster and a mess to clean up! When the syrup hit a bubbly 250 degrees on a candy thermometer, the heat was cut off and the syrup is allowed to cool briefly back down to 220 degrees before using it. Do make sure you use a thermometer which has the temperature reader that reaches almost all the way down to the bottom of the pan. I used a classic one like this - I notice the temperature dropped past 220 within a minute or two, even though it looked like the bulb was sitting in the syrup. I knew that couldn't be right and tipped the pan towards the bulb - yep, it was still quite hot! The syrup just did not come up high enough for an accurate reading. Once it had cooled slightly, the syrup is poured in a mixing bowl that already contained bloomed gelatin and a healthy scoop of Dutch-process cocoa powder. What is bloomed gelatin? This step of softening the gelatin granules ensures a silky smooth end result. All you need to do is sprinkle the granules over a bowl of cold water and let it sit for a few minutes. You'll notice it absorb the water, expand and become very hard. You can't use it like this just yet - the next step is to gently heat the bowl over a pot of simmering water to dissolve the gelatin. This liquefies the mixture quickly, making it very fluid and ready to use. 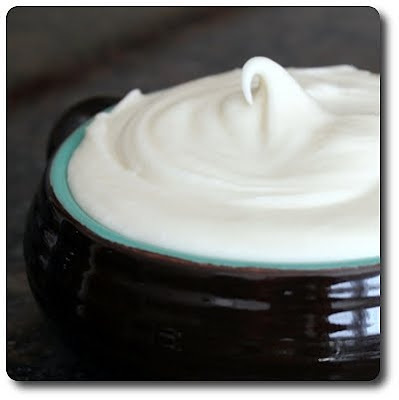 With the still-warm syrup added to the mixing bowl, the stand mixer does all the strenuous work by whipping lots of air into the sweet concoction. This will take several minutes - you will know when it's ready when the volume has greatly increased and sticky mixture holds a stiff peak. I do feel like I should give you a warning - when I say sticky, I mean s-t-i-c-k-y. This will stick to anything and everything it comes in contact with until it sets. Just do your best to scoop as much of the warm marshmallow goo that you can into the well-prepared pan (don't skimp on this - follow the directions in the recipe!) and anything that stays behind, just leave it (or scoop it out with a spoon for a snack). Don't stress about cleaning - it may be sticky, but it will dissolve in a snap when the mixture comes in contact with water. 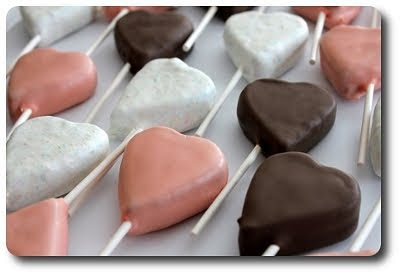 One more tip - give the marshmallows plenty of time to rest before you cut and dust them. Overnight is best, but give them at least 6 hours. These bouncy beauties have a soft, billow-y texture to them and after you place one in your mouth, you get a bit of resistance with your first chew, but the mallow quickly gives way and starts to melt on your tongue. 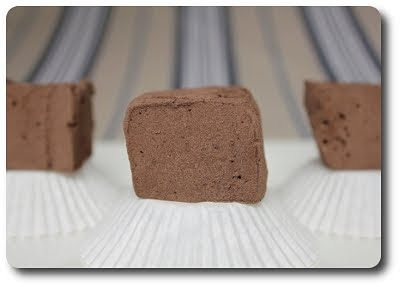 The honey flavor is fairly faint, but using the milder Dutch-process cocoa allows its natural sweetness to come through without being too dominating. 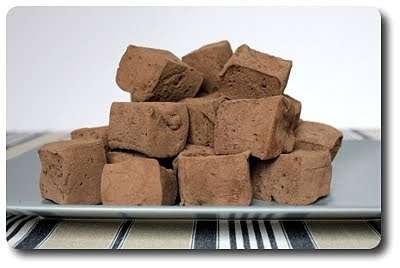 If you've never had a homemade marshmallow, you are definitely missing out - they completely blow away any pre-packaged factory-made marshmallows you would find in your market.